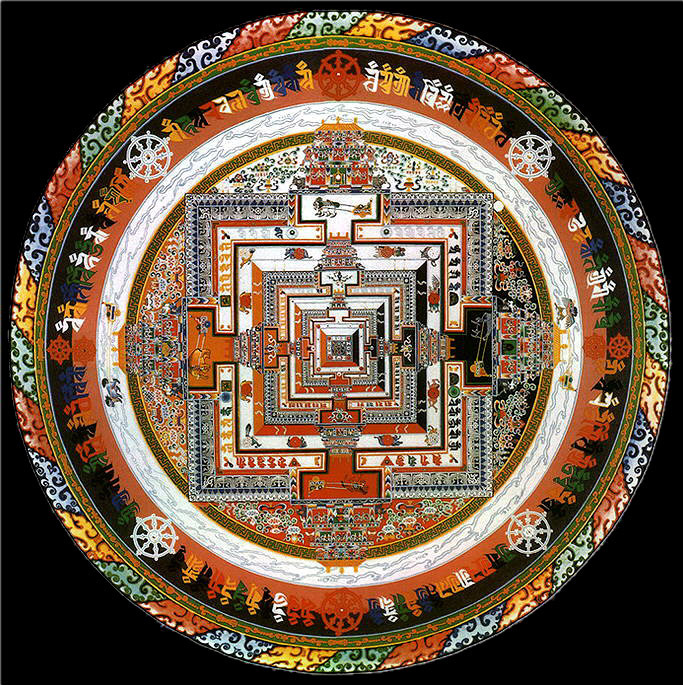 I have been caught up so much in my own endings and beginning lately, that I have forgotten the larger picture, the mandala of life. I gave my last tour at the Cathedral today before we move up to Katonah at the end of next month, and it was no coincidence that I was leading a tour about symbols in the Cathedral, because I needed to see them. Circles, mandalas everywhere - the rose window, the Celtic designs in my favorite chapel, St. Colomba, the pilgrims pavement - there is no beginning and no end. The Dalai Lama and a retinue of Tibetan Monks have been in NYC for the past two weeks, reminding everyone of the promise and hope of peace. The monks were working on a special installation of a sand mandala in St. Boniface chapel. Yesterday at the Cathedral I took a group of sixth grade boys to see the Tibetan Monks finish up the work. We were stunned to see the the almost-final product: white sand finely ground and mixed with watercolors painstakingly placed to design a symbol of the impermanence of life. When I came in with a group of teenagers this morning and brought them to St. Boniface chapel, I was brought up short: of course - the sand mandala installation, The Sands of Time was gone. Part of it's purpose is to be destroyed, sands to be used as offerings for world peace. It reminds me of the Hindu goddess Kali, the small figurine on my altar representing both Creator and Destroyer. Beginnings and Endings. And at the same time, I am part of the Alpha and the Omega. There is something excruciatingly comforting about this as I move through leaving my home - the impermanence of material things, of matter. Yet we matter. And that must mean that I matter too, as a child of the universe, and that my charge is to write the-world-as-I-see-it, in all of its gloriousness and messiness, even if very few people read my words - this is how I make sense of the world and connect to the human race. Thank you for writing a beautiful post. It contains words someone here needed to be reminded of today! Your moving out of the city reminds me so much of your grandmother's trek to another world while raising her children. I have never been to New York (well,I passed by the Bronx in a van with two kids and hubby once scared to death of the traffic! )so I it is hard to imagine just what all the move means to you. It's a BIG change! My Gran came back to the city after spending the 1950's in the country. She also wasn't able to publish during that time - until WRINKLE! That is awesome, Lena. I know God has so much greater things in store for you. I will be praying for you and your family. I know it sounds odd since I do not know you personally neither do I know your family. BUT, I know you're Grandmother, well, at least I think I do. It's just that God used your Grandmother in such a big way and she had impacted so many areas of my life and she still does. I'm currently reading The Young Unicorns. Awesome, awesome story! Thank you Donna for your kind words and prayers. :-) The Young Unicorns is one of my favorites with the backdrop of the Upper West Side and the Cathedral! My husband and I just witnessed the closing ceremony of a sand mandala, up here in Connecticut. It was great fun. The monks were fabulous and the ceremony itself was lovely. I loved the instruments. I have a bunch of photos on my facebook page. The picture of the mandala you posted is lovely. I think it's the same group we saw. Did they live in people's homes? I noticed that the little kids adored the monks who stayed with them. There were plenty of hugs all around. That's awesome, Sandy! I wish that I had gotten to witness the closing ceremony - it sounds amazing - I'm so glad that you got a chance to spread that joy! I'll have to check out your pics! I always like visit your page because you select very interesting and nice topics. That is very help for me in uk rushmyessay writing now i pick more precious points from this topics because this is very nice topic.